Oil seeps out of the sediment in this hole dug on Eleanor Island, August 2013. Photo by Amanda Johnson. Through our Hydrocarbon Toxicity Project, we research and address the gaps in knowledge regarding chronic toxic effects of oil, dispersed oil and in-situ burn (burning spilled oil) residue under study conditions similar to the cold marine waters in our region. Chemically-enhanced water accommodated fractions (CWAF) – the mix of water and hydrocarbons resulting from chemically dispersed oil. These materials are included on the Environmental Protection Agency’s lists of compounds that have been identified as chemical pollutants. The data from this project will be of important use to our long term environmental monitoring and dispersants projects. We hope to enhance our understanding of the major classes of compounds that result from spilled oil and the in-situ burning process. We will be testing to determine the chronic toxicity of these substances and evaluate how they behave in a dispersant and oil mixture. We will be working to identify appropriate biomarkers for testing chronic toxicity derived from crude oil hydrocarbons. The work will also involve a literature survey on the polar PAH related fraction in Alaska North Slope crude oil and the toxicological and endocrine disruption issues associated with it. This project will ultimately help improve decision-making for oil spill responders. 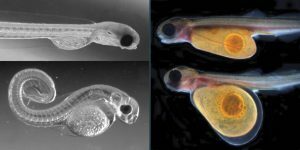 Low levels of exposure to crude oil affects salmon and herring embryos. The 1989 Exxon Valdez disaster exposed the embryos of pink salmon and Pacific herring to weathered crude oil in shoreline habitats throughout Prince William Sound. The Pacific herring population collapsed four years later. The role of the oil spill, if any, in the forage fish decline has remained one of the most prominent unanswered questions in modern natural resource injury assessment. Studies subsequent to the spill identified disruption of heart morphogenesis as a major impact of polycyclic aromatic hydrocarbons (PAHs) derived from crude oil. Here we show that pink salmon and herring embryos exposed transiently to trace levels of Alaskan crude oil develop cardiac abnormalities that lead to permanent changes in heart anatomy and physiological performance. When assessed after 7 to 10 months of growth in clean water, both species showed reduced aerobic capacity and common changes in cardiac morphology, including evidence of ventricular hypertrophy. Therefore, the Exxon Valdez oil spill likely impacted pink salmon and herring more than previously appreciated. Moreover, the particular sensitivity of herring embryos to PAHs suggest that the catastrophic collapse of the Prince William Sound population may have been caused in part by delayed mortality due to developmental cardiotoxicity. These findings extend our understanding of the long-term impacts of oil spills, and apply also to more chronic inputs of PAH pollution to aquatic systems from land-based runoff and other sources. A group effort between the Canadian Department of Fisheries, Queens University and the U.S. Environmental Protection Agency used 5-6 classic bio-indicators that were developed in the 80s and 90s but not really linked to community level or ecosystem level effects at that time. These indicators were previously used more in acute toxicity testing. This effort looked at chronic toxicity. Studies have been conducted on the effects of high-level exposure to crude oil on large animals, such as sea otters and birds. However, not as much is known about the effects of oil on smaller species, such as zooplankton. Zooplankton and other small species are important to the health of any marine ecosystem. They are the building blocks of the food chain, providing food for larger animals. One of the first steps in beginning such research is finding out what information already exists. This step helps identify gaps where more research is needed. The researchers looked at the results of studies conducted after large spills such as the Exxon Valdez spill and BP’s Deepwater Horizon explosion in 2010. 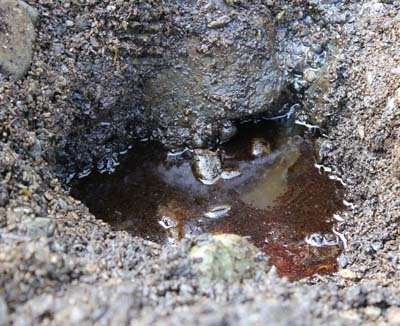 An underwater plume of dispersed oil can form after application of dispersant to a large oil spill. Zooplankton have been shown to ingest dispersed oil both in the field and laboratory. Studies carried out after oil spills treated with dispersants have shown effects on the growth and reproduction of zooplankton. The study also identified priority areas for future research on effects of dispersed oil on zooplankton, including effects on growth and reproduction and whether the cold water zooplankton found in Prince William Sound would respond differently to exposure than warmer water zooplankton.